jOLIE! Marketplace new pretty items are now avaible! *Baggy Pants! : 1 trousers baggy modded, 1 leggins style, 3 patterns to choose. *Knot Shirts! : pretty short shirts with knot in the front and jewels. Waiting for releases single dress avaible! I’ve been really busy with my RL birthday [yay! 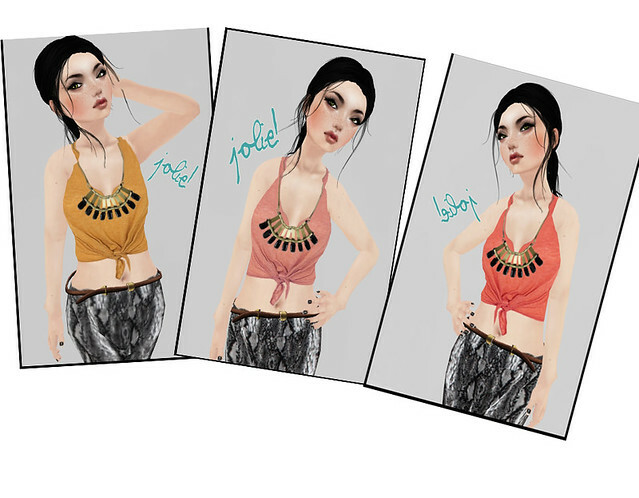 <3] So I’ve found the time to set up all new stuff for the last jOLIE summer release but I’ve still to edit some pics so.. while you’ll wait I’ve upload in the marketplace all Distressed Denim Shirt/dresses colors! So if you like one, you can purchase it as a single item! In these days I’m working on new pretty things, so i’ll show you a little teaser of what the next release will be about. Aoharu is running a big 50% off sale ❤ and Maitreya Group Gift she sent via som is so cute! Lovely pumps easy to style up with every thing! Finally Distressed Denim Dresses are released in more colors! After my purchase I made up this pretty quicky style!